Tom....Tom...what the heck was that guys name? Dammit! Ok...one more hint-please? Howsabout the production company? PRC,Monogram,Republic? I beg of you! This is driving me up a wall! Cripes. 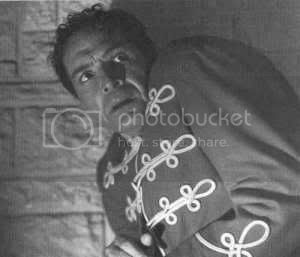 It don't look like Laird Creiger or Lionel Atwill or Tod Slaughter....AHHHHHH! DAMMIT! This is like Chinese torture! Don't feel bad. I sat there for nearly an hour going over horror movies from the 40's on imdb.com last night, and tried to cross-reference names of actors with the hints. Never could find anyone who dropped out of film for awhile to come back to B-westerns. I DID find a guy who went from this to B-westerns, but there wasn't any break. I guess it depends on your concept of a break from acting. So, any other little tidbit that might launch another round of sleuthing? But why did they go back and put fangs on the image? "A Ghost? A Smiling Ghost, you say? Are you MAD?!?" Okay, I grew up watching these old black and white films as a kid, but I feel like I've missed a whole era in my crap film education that everyone else my age seems to have. I feel...cheated. Ah, screw it. I'm just looking for a good copy of "The Human Duplicators", which is one of the movies I cut my teeth on. So many guesses, so little time; the point is you got it. Still no GEORGE ZUCCO here... Well, despite your devotion to GEORGE ZUCCO, Raffine, Javakoala has correctly named the film: THE SMILING GHOST (1941)... and that leading man was WAYNE MORRIS... back atcha Java. Congratulations to Javakoala for figuring out THE SMILING GHOST, despite your devotion to Richard Kiel based sci-fi. 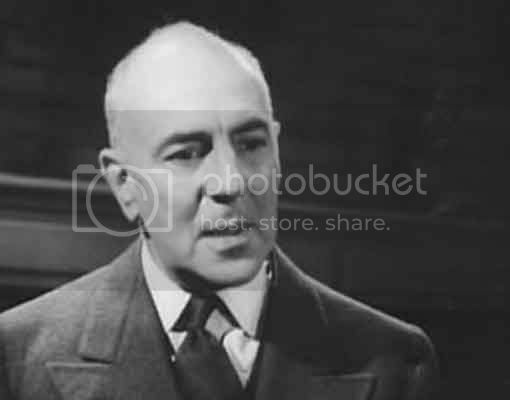 George Zucco is so five minutes ago. Now it's J. Carrol Naish all the way! For the love of god, Raffine, the man's last film was an Al Adamson film. I don't know whether to laugh or weep. Having seen that movie many times, I have done both. And my devotion is all for Beaver's dad, Hugh Beaumont. He's from Lawrence, KS, which is just east of Topeka. Every time I leave Lawrence, I whisper, "Weren't you a little hard on the Beaver, dear?" in his memory. So, where's the next pic, Javakoala? I have not inverted this to make it harder. Craptastic filmmaking from the 70's at its best. This one is a bit hard to find on DVD, so good luck. Short Night of Glass Dolls? Probably not because I saw it on DVD. Maybe the Clonus Horror? I haven't seen that one yet, so I dunno. No, but the title has me intrigued. Oh heck no. 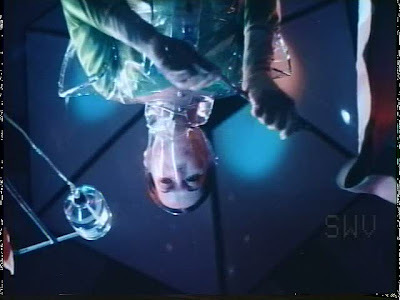 But I definitely recommend watching Clonus, the non-MST3K version. It's rather good for a low-budget film.